Welcome to this month’s Blogorail Green Loop. Today we are taking you on a virtual tour of Epcot’s World Showcase. 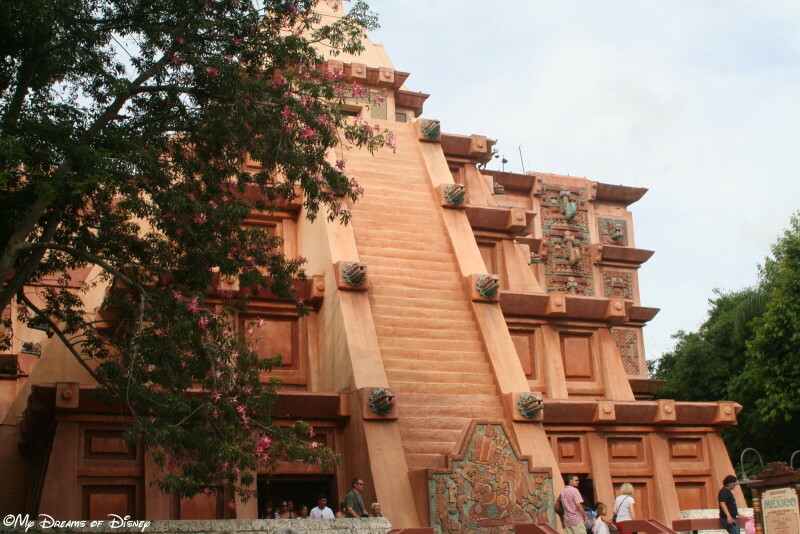 The Mexico Pavilion is housed in an Aztec style pyramid! Welcome, friends, to the Mexico Pavilion, one of the eleven incredible countries depicted in the World Showcase of Epcot! 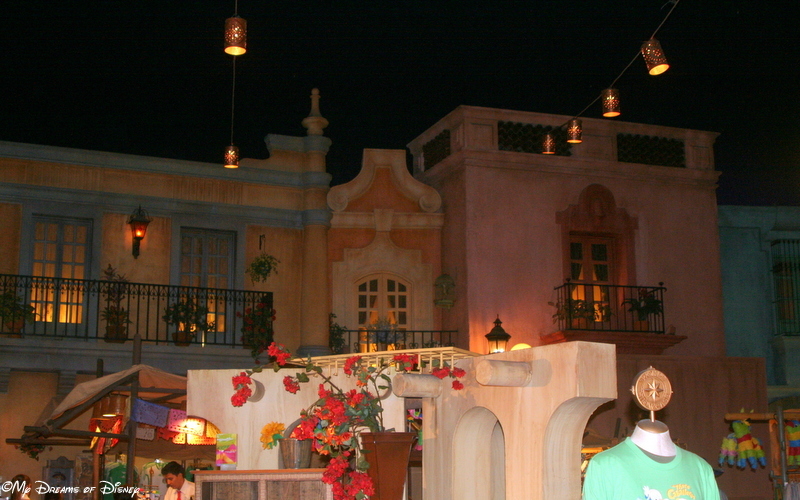 I’m joining my friends at the Magical Blogorail in talking about each of the pavilions, and I’m going to tell you why I love the Mexico Pavilion, and describe in more detail what you can experience when you visit this country — one of the original countries at Epcot! The Mexico Pavilion is one of my favorite World Showcase countries. 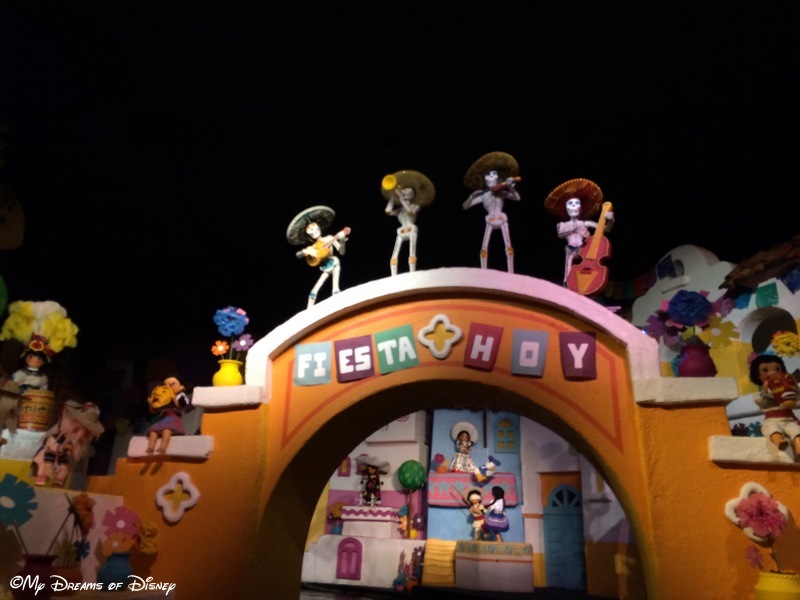 Featuring a nighttime outdoor market theme, wonderful shops, incredible smells from the San Angel Inn, and the Gran Fiesta Tour Starring The Three Caballeros, this pavilion has it all! For starters, the structure that is the focal point of the pavilion is the Aztec style pyramid that houses the pavilion. Inside this structure is the open air market, pictured below, with it’s subdued lighting and aesthetics. The Disney Imagineers are such incredible storytellers, when we enter the pavilion I am immediately immersed, perhaps even transported, from Florida to a spring evening in Mexico, with twinkling stars and the smell of delicious food wafting through the air. The open air market depicted in the Mexico Pavilion is one of it’s biggest selling points! Aside from shopping, there are many more things to do. For starters, the San Angel Inn is located in the pavilion; while I have not eaten here, in my mind it is the perfect romantic setting for a wonderful date. This is because the seating overlooks the launch site for the Gran Fiesta Tour Starring The Three Caballeros! This ride takes you on a relaxing journey through the heart of Mexico, and you find out that Donald Duck has gone missing — perhaps because of his love of the women? In any event, your journey follows Panchito and Jose Carioca as they look high and low for Donald so that they can perform their concert! Be on the look out for Donald Duck, help Panchito and Jose Carioca find him! In addition to the San Angel Inn, La Cava del Tequila features appetizers and over 200 varieties of tequila for you to choose from; personally, it’s not my style of hangout, but that’s just me. Outside of the pavilion is La Hacienda de San Angel. This restaurant, pictured below, is strategically located on the lagoon for great viewing locations of the Illuminations: Reflections of Earth fireworks show. La Hacienda de San Angel is located outside the Mexico Pavilion on the World Showcase Lagoon. Additionally, Donald Duck makes his presence known both inside and outside the pavilion. Perhaps the reason he couldn’t be found on the Gran Fiesta Tour was because he was getting his picture with my daughter? 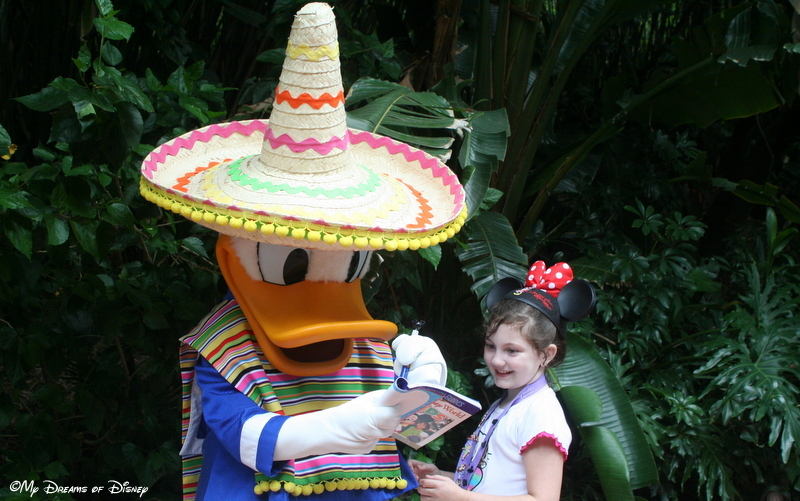 Donald Duck signs autograph books and poses for pictures inside and outside the Mexico Pavilion! Thank you for stopping by today, and taking a stroll into the Mexico Pavilion with us! Do you like this pavilion? Please let me know in the comments, and thanks! 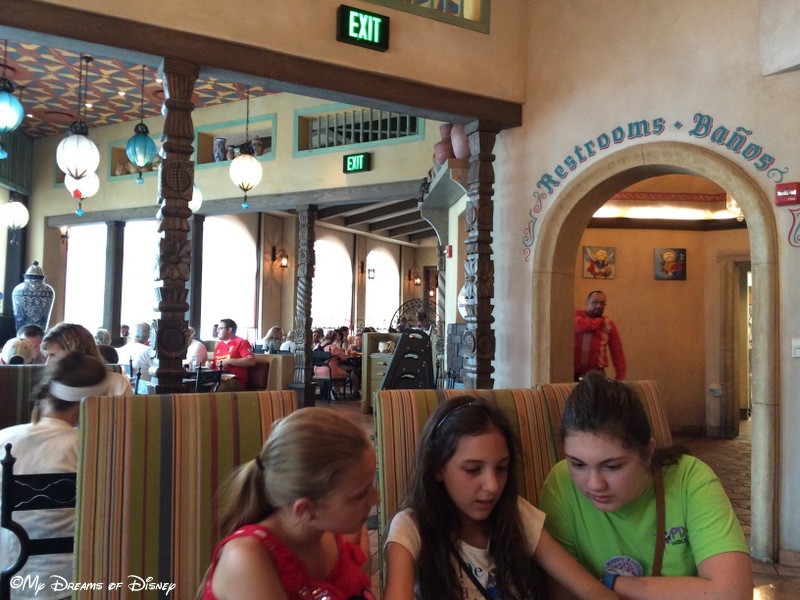 For more info on Epcot’s World Showcase, check out the other great posts from the Blogorail!